In Montréal, under a giant tipi, the largest Wampum in the world shall be unveiled, and the Place des Festivals, for the space of a weekend, will be transformed through Native art and its animal symbols. Within this vibrant décor, unforgettable performances will take place: Loto Québec's Boréades de la danse, with Indigenous dances from Canada to Bolivia to Mexico; two projections/concerts of Nanook of the North accompanied by Inuit throat singers, with eight performers on stage, under the direction of world-renowned composer Gabriel Thibaudeau; demonstrations of visual arts and craft techniques practised since the earliest human occupation of the Americas; and to conclude, in collaboration with Amnesty International, words of wisdom for living in harmony with Mother Earth. All these activities in celebration of the twentieth anniversary of the First Peoples Festival are presented free of charge, August 6, 7 and 8, 2010, at the Place des Festivals. Indigenous dances from Canada to Bolivia to Mexico. 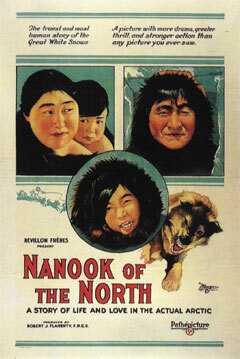 Composer Gabriel Thibaudeau shall conduct an octet, including Inuit performers of katajak (throat singing), accompanying the projection of Robert Flaherty's immortal classic. Sunday, August 8 from 10:00 a.m. to 3:00 p.m.
Wood and stone sculpture, basket-making, flint-cutting, beadwork, etc. Sunday, August 8 from 3:00 p.m. to 6:00 p.m.
At the 2010 First Peoples Festival, the Mainfilm jury is awarding the Young Hope prize to Windigo. With the echo of ancient legends, Kris Happyjack-Mckenzie has made a video with very contemporary resonances and has shown remarkable talent in an inspired director's feat. This has earned him the Télé-Québec New Talent prize for Windigo, a Wapikoni Mobile production. For its vivacity, humour, and its light, impulsive brushstrokes sketching playful figures, and for the stone canoe carried off like a leaf in the eternal currents of the Mi'gmag legend this film brings to life, the 2010 First Peoples Festival jury awards the Best Animation Film prize to Petit Tonnerre by Nance Ackerman and Alan Syliboy. Vacant lots lead to vacant souls and make childhoods spent drifting through them forlorn indeed. For these blues from the edge of town, where hope tries to take root like a stubborn little weed, the 2010 First Peoples Festival awards the Best Short Film prize to Welcome by Daniel Gerson. Black and white is an apt choice for Navajo country and the austere majesty of its unattainable horizons. For quenching our thirst for departures and depicting a ponderous reality in the pulsating light seeping into the hogan and shining in the pasturelands, the 2010 First Peoples Festival awards Smokey Nelson the Best Photo Direction prize for Shimasani by Blackhorse Lowe. The crystal springs that make the land of childhood seem so sunny always gush up in uprooted people's memories. For an intimate portrait of a Mazahua woman and her humble exile in Mexico City, Rehje, by Anais Huerta and Raúl Cuesta, has earned the Best Documentary prize awarded by the journal Séquences. For her exceptional skill at getting round the pitfalls inherent in made-to-order films with disconcerting ease, and her sensitive rendering of the dreams and concerns of Atikamekw youth in an unpretentious documentary, the Séquences journal jury awards an honourable mention to Tcikitanaw by Anne Ardouin. Cultures do not want to die and ancient tongues are stubbornly passed along to younger generations. 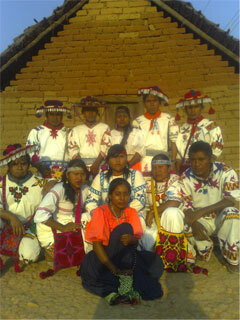 Upon viewing this film that recounts a case of cultural resistance among a group of Xavante people displaced near a Salesian mission, and to mark the remarkable work of an NGO that trains video artists who can work in indigenous languages of the Americas, the 2010 First Peoples Festival jury decided to award the Camaras de la diversidad prize to Sangradouro, produced by Video nas Aldeias and directed by Amandine Goisbault, Tiago Campos Tôrres et Divino Tserewahu Tsereptsé. For a documentary illustrating the vital link connecting land, animals and humans and revealing the major cultural impact of Canadian authorities' decision to slaughter Inuit sled dogs, the First Peoples Festival jury awards the Rigoberta Menchu Second Prize to Qimmit: un choc, deux vérités by Ole Gjerstadd and Joelle Sanguya. The taste for success is like green apples: you have to pucker up to appreciate it. Tears and teeth gnashing await the young Inuit facing athletic and academic challenges, as generous, involved teachers strive to impart the concept of personal best. The film crew shows the same passion, and succeeds in involving viewers in a thrilling human adventure while delivering an extraordinary lesson in pedagogy. For this flawless documentary achievement, the 2010 First Peoples Festival awards a perfect mark and the Rigoberta Menchu Grand Prize to Les vrais gagnants by Jean Fontaine. In a clammy and dark enclosure, a few sorry rugby players forgotten by history decide to change the course of their own history. For rendering a key episode in the Maori people's national affirmation with a remarkable economy of means, and to salute the up-and coming young filmmakers with the same energy as the athletes they depict, the 2010 First Peoples Festival awards the TEUEIKAN Second Prize to Warbrick by Meihana Durie and Pere Durie. For the strong impact of a concise, controlled story line accurately depicting the intergenerational and identity-based laceration so many First Peoples suffered when their children were torn from their natural milieu in the name of progress, and for a strong work of art in which a young director is already affirming an authentic filmmaker's signature, the 2010 First Peoples Festival awards the TEUEIKAN Grand Prize to a short film that has a lot more to say than many longer films: Ivan and Ivan by Philip Abryutin. The Canoe: Mayan hieroglyph, signifying "route". 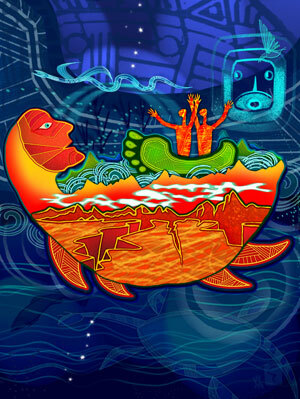 The Red Travellers: they are inspired by the petroglyphs of Turtle Island. They are looking at the face of their ancestor, the Earth. The linear motifs are inspired by the ancient pottery of north-eastern North America. The Earth: an inverted turtle contains an ocean of rolling waves. It is a Red Earth, one in the same young and ancient. The Sun: Mayan hieroglyph for the Sun. The nocturnal Sun illuminates the Serpent, the cosmic symbol of knowledge and of the infinite. The trees evoke the world of the stars, from which they originated. They were brought to the Earth by the Sky Woman. The bird is the eternal intermediary between the divine and the temporal. 20 years old is far too young for nostalgia. It is the age to fly on your own two wings and to take hold of your destiny. For the Montreal First Peoples Festival, 2010 is a year of major redeployment - a significant turning point allowing First Peoples' art to be showcased in the major arena it warrants. Larger-than-life photos of traditional life with the words of Innu poet Joséphine Bacon in the exhibition Matshinanu/Nomades, an over-sized central tipi to be erected on the great Place des Festivals in August, and activities stretching all summer long, take the Montreal First Peoples Festival, the star First Nations event, to the first magnitude. No time to rattle on; long speeches can wait until later. Like a countdown, we pronounce the following words - June, July and August. One season, two times, and a single movement. Happy Birthday, Montreal First Peoples Festival! It is with sadness and consternation that the news of the death of Merata Mita, Maori filmmaker and militant for the rights of Indigenous Peoples, has been received in Montréal and throughout the world. Merata Mita visited Canada for a retrospective of her films that the Montreal First Peoples Festival presented in 2003 at the Cinémathèque québécoise, and her presence left indelible memories in the minds of her numerous friends. She has handed down an important cinematographic and social legacy to the Maori people and the Indigenous Peoples of the south Pacific. Merata Mita was a pioneer in her field and her actions contributed to the advancement of human rights in her natal Aotearoa (New Zealand) and throughout the world. The Montréal First Peoples Festival expresses its sincere condolences to all who are affected by her passing.